No one in Taunton probably was more delighted at the prospect of a contest in Taunton than Mr Tom Lock, who is well known as the last of the pottwallers. He is in his 93rd year and has had the privilege of voting for Parliamentary candidates in the borough for almost 70 years. He is probably the oldest voter on the register in the whole of the county of Somerset, if not in England, who was able to record his vote during this election. Even now Mr Lock can read without the aid of spectacles. Taunton, as far as the matter can be traced, was a borough town as early as the common people became privileged with a representation. It sends two members to parliament. The powers of election here are subject to the following restrictions. This right is limited to the borough, the bounds of which, as to the rights of election, so far from co-extending with those of the town, do not coincide even with those of the parish of St Mary Magdalen, which lies within the town. There is something particular in the method used by some persons in this town to qualify themselves for being electors in the choice of members to represent them in Parliament. It is a privilege of this place that every pot walloper, that is, all who dress their own victuals, are entitled to vote. In consequence of this privilege, the inmates or lodgers, some short time before an election, have each a fire made in the street, at which they dress victuals publicly, less their votes should be called in question. The election of members of parliament for this borough is very singular; every pot walloper or inhabitant who dresses his own victuals, is entitled to vote; so that inmates or loges to qualify themselves a little before the election come on, make a fire in the street and there boil their victuals. The right is further confined to parishioners, not be stated paupers, not receiving any share of the alms distributed from the funds of the respective charities left to the town. On Monday evening the death occurred of Mr William Garland of Bath Place, boot and shoe manufacturer aged 87. Mr Garland was one of the last of the old pot wallers – indeed there is only one, we believe, now remaining the the town in the person of Mr Tom Lock, who is aged 83 but of vigorous habit, considering his years and erect as of yore. The venerable system of the “potwalloping” vote will there be extinct in the town at the death of Mr Lock, who we trust, may be spared for many years. I notice that that perennial evergreen, the last of the Potwallers is still en evidence and the sturdy old octogenarian exhibits few signs of bending with the weight of years. His stalwart proportions looms erect and comparatively vigorous from out the most of bygone local history. A generation must have passed since Mr Tom Lock performed the homely but not very scientific feat which secured him a vote for life viz. boiling his own pot, and there is not small consolation in the fact that Mr Lock has survived by many years the decease of so extraordinary and ridiculous a qualification for the exercise of the franchise. Mr Lock was in his younger days a politician of considerable activity and his knowledge of the intricacies and the questionable method of the local political system of that time, combined with a retentive memory, renders a conversation with him at all times interesting and instructive. He served for some years as warder in the Somerset County Gaol, in Shuttern, and it was only a few evenings since I heard him recounting the extraordinary sensation which assailed him whilst keeping guard in the condemned cell in which the notorious publican Joel Fisher was confined previous to his execution for the murder of his wife at Weston super Mare. As Mr Lock says that on one occasion he was in the cell with Fisher from 7pm until 6am the following morning, one can hardly wonder at the tension of his nerves all that time. The execution took place in 1844 and caused a considerable sensation in the town. Mr Lock who has been remarkably free from the ills that afflict humanity during his long life, and can even now see to read his newspaper without the aid of glasses, has lately been prostrated by an attack, I believe, of pneumonia, but his renewed health leads me to hope that he may long remain in the flesh, the last of the Potwallers. “At the top of High street, Taunton, abutting on Vivary Park, between the site of the Savings Bank (formerly occupied by the Full Moon) and the entrance to Wilton House there stood at one time a group of small tenements. Through one of those houses ran a small stream of water. Another was dedicated to Bacchus, and this house bore the somewhat unique sign of “Hit or Miss”. Mr Tom Lock reaches his 92nd year today and his many friends in the town will still wish him happy returns of the day. Despite his great age, until within the last few days, Mr Tom Lock was to be seen walking about the main thoroughfares, his tall herculean frame being very little bent, considering the advanced age he has attained. 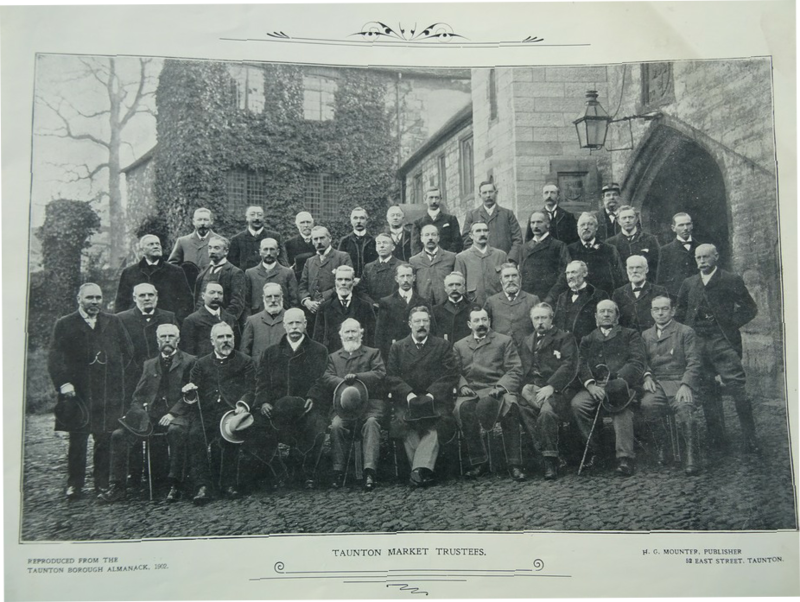 The Committee [of the Taunton Market Trustees] reported that they had received an application on behalf of Tom Lock, is now 95 years of age, for some further assistance during a serious illness from which he is suffering and which necessitated special treatment. They recommended that 7s a week [instead of 4s as present] be paid him during the continuation of his illness. On the motion of Mr. Lewis, seconded by Mr Wickenden, it was decided to give him 10s a week instead of the 7s recommended by the Committee. A well-known personage of Taunton, who has been present at some stirring political scenes in the borough, some of which have become historic, has, we regret to say, just passed away in the person of Mr Tom Lock, who died on Tuesday morning last. Tom Lock, as he was familiarly called by all who knew him was a Tauntonian and had reached the great age of 95. For some years he had been living at the house of his nephew, Mr Thomas Bosley, of High Street, Taunton, having been a widower for many years. He never had any family. 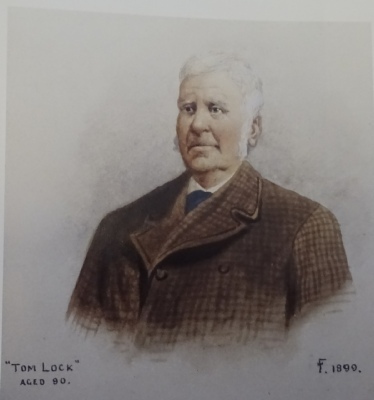 Tom Lock had become well known as being the last of the “Pot Wallers” by which term is know that a person was entitled to the franchise by reason of renting a room with a fire-place sufficient capacity to boil a pot. The last time he voted in this capacity was in the General Election of 1900 when Colonel Welby was opposed in Taunton by Mr Walker King. The Radicals subsequently object to his vote and Mr Lock’s name, as a result, was afterwards struck off the register. During his long life Mr Lock filled many offices. He was for 18 years a warder at the old Taunton Prison and for 35 years was toll collector to the Taunton Market Trustees, gaining the esteem and regard of the members. In politics he was a staunch Conservative. For many months past Mr lock had been in failing health, and notwithstanding the attention and skill of his medical adviser, Dr Macdonald, he passed away as the result of old age. Mr Tom Lock informs us that he remembers seeing the man Obediah dive from a very high ladder into the River Tone near Mr Trood’s house. Before taking the dive he did several acrobatic feats on the top of the ladder, while a mate of his made a collection from the hundreds of people assembled, not only on the bridge, but in the boats on the river to witness the dive. Mr Tom Lock informs us that whilst a drummer in the old Militia he has often gone with the Recruiting Sergeant beating up recruits. Sergeant Phillips, of the Coldstream Guards, was stationed in Taunton for recruiting purposes, and with the permission of Captain Healy, the then adjutant of the Militia, he often took drummers with him to the neighbouring towns recruiting. He also attended the Taunton Races and many club-walks in the neighbourhood. Mr Lock also informs us that he has always understood that the 2nd Regiment of Foot was Colonel Kirk’s original regiment.